The first recorded medicinal use of bilberries was in the 16th century, when preparations made from the berries and dried leaves were given to treat patients suffering with urinary tract infections, scurvy and kidney stones. During World War 2, British RAF pilots reported that they experienced an improvement in their night vision after eating bilberry preserves. Scientists are yet to confirm the pilots’ claim comprehensively. However, Dr David Keifer from the University of Wisconsin states that ‘it makes sense that bilberries have a reputation for helping conditions ranging from retinopathy (abnormal or damaged blood vessels in the eye) to diarrhoea and heart disease. Many of these conditions have an inflammatory component.’ Bilberry contains anthocyanosides, chemical compounds that have powerful antioxidant and anti-inflammatory components. One study of 50 patients suffering age-related cataracts revealed that bilberry extract taken in combination with vitamin E inhibited the formation of cataracts. One of the major constituents of bilberries are anthocyanosides, which are potent antoxidant and antiinflammatory agents. They help the body fight off free radicals, unstable oxygen molecules that damage healthy cells. Bilberry is used to maintain healthy vision and treat various eye conditions, including diabetic retinopathy, macular degeneration, glaucoma and cataracts. Anthocyanosides improve blood flow in capillaries, so can reduce atherosclerosis, or hardening of the arteries. Reduces inflammation of haemorrhoids, varicose veins and phlebitis. May relieve symptoms of fibrocystic breast disease and menstrual cramps. May help treat stomach ulcers. 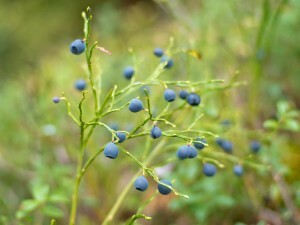 May help diarrhoea (German doctors often prescribe bilberry tea to relieve stomach disorders). May ease mouth and throat inflammations. Talk to your medical practitioner before taking supplements. Avoid bilberry if you have low blood pressure, diabetes or are at risk of stroke. Not to be taken by pregnant or breastfeeding women. Consult your healthcare practitioner before taking supplements. Dried berries are used to make bilberry tea. Bilberries are common in the cold temperate parts of the northern hemisphere, so it’s not easy to grow them in the warmer South African conditions. If you can’t find fresh or frozen, get bilberry’s goodness in capsule form from Dis-Chem or Clicks and online from Faithful To Nature.